After some recessionary fluctuations, retail crimes declined to 1.32 percent in 2012-2013 of total sales in retail in contrast with 1.37 percent in 2011. A decade prior, the retail related cost stood at 1.77 percent and 1.29 in 2010. Retail crime refers to loss of stock due to crime, error or waste and usually calculated as the percentage of sales. 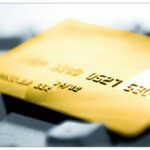 Between 2012 and 2013, customer theft stood at £2.206 billion, employee fraud and theft at £1.681 billion, warehouse and supplier fraud at £246 million, card fraud at £85 million, burglary and robbery at £120 million, criminal damage at £81 million, and cyber-fraud at £280 million for a total of £4.699 billion. Within the same period, the loss prevention and security related cost stood at £995 million in the retail industry. Thus, the total cost of retail crime stood at £5.694 billion. 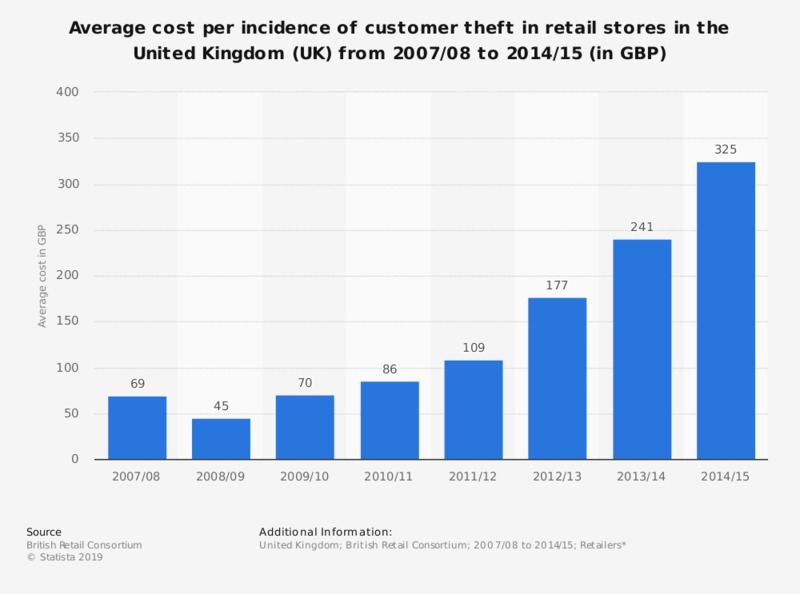 In 2015, the British Retail Consortium reported that retail theft had gone down but the value of a single theft is now very expensive at £325. Across the UK however, the yearly retail crime cost went up to £613 million in 2015 and stands as the highest since records started being kept. The reason for this is that criminal gangs have become sophisticated and have target luxury goods such as hi-tech gadgetry and designer clothing. In contrast with 2014, it was a 2 percent increase on the retail industry. While the direct crime cost has broken the record and the highest in recent memory, it's three times more than the cost of retail crime in 2007-2008. The offences numbers have gone down just like in 2014 with about 750,144 reported incidents. With the high value of stolen items being very high, the dropped crime incidents indicate that the dip is not worth talking home about as the retail crime has basically changed in sophistication as theft to order is catching up. Customer theft continues to account for most of the retail crime incidents, which is about 83 percent in total. Retail crime equipment has also increased in sophistication as bags that are foil-lined and de-taggers are used to lower chances of being detected even as reports and surveys indicate 40 percent of the crimes are attributed to organised gangs that usually work in groups. At the same time, online cyber-attacks have been on the rise by 55 percent. They account for over a third of the entire retail crime cost at 36 percent. Retail crime's human cost has also gone up with a 28 percent rise in cases that involved violence or abuse against retail staff. The increase stood at 41 crimes out of 1,000 committed crimes in contrast with 32 offences of a 1,000 committed crimes in 2014. This shows that the cost of crime in the retail sector has been burgeoning in finances and human cost. This comes as retailers continue cutting food and clothing costs to lower the average cost of a shopper's weekly basket as gangs of criminals are going for very sophisticated theft techniques to steal luxury goods and target retail employees, not only with violence but also with abuse at their work stations in retail shops. Analysts believe the retail sector has a difficult time ahead as police budgets tighten and tough choices on policing priorities and resources lie ahead. It means that businesses and the police have no choice but work together to deal with retail crimes as a unit. In 2010, the estimated cost of employee error, staff theft and shoplifting in the retail sector stood at £4.9 billion, the highest figure ever recorded then. This was believed to have worsened economic conditions and fuelled even more crimes in the same sector. By June 30th 2011, the retail crimes in the UK rose by 6.2 percent as per reports by the Global Retail Theft Barometer. Shoplifting losses were almost 44 percent of the £4.9 billion while employee error and theft was about 36 percent in 2010. In 2012, the total cost of retail crime had gone down to £1.6 billion. However, these figures are just a little part of the huge problem that's retail crime considering about 9-10 percent of customer related theft is reported. With the retail sector injecting £321 billion to the economy or 20 percent of the entire GDP annually, the retail crimes increase is not good news and means it's not just the retail sector that's losing. It means the retail industry has no choice but invest in retail related security from using sophisticated technology such as electronic article surveillance, sophisticated CCTV, merchandise alarms, bulky packaging and dye/ink tags among others. According to the PWC Information Security Breaches Survey of 2015, security breaches have gone up in terms of cost and scale with over 10 percent of those surveyed indicating that they had to change their businesses and the way they do business due to the worst breaches they've encountered.